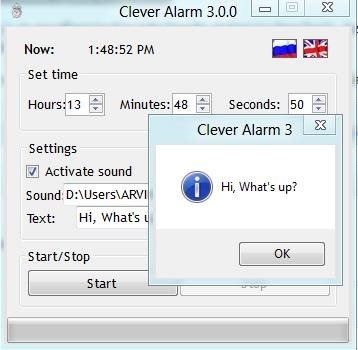 Clever Alarm 3 is a free desktop alarm clock for Windows 8, which allows user to create sound and text notification on your desktop. You can set alarm in different modes such as for lunch time, for break time, tea-time, and the like. Once set, it will show up a pop-up for each specified break with a text notification on it. Clever Alarm 3 just takes 50 KB space on your hard disk. This portable tool provides a user-friendly deal with an intuitive graphic interface. You can set predefined alarm in terms of hours, minutes and seconds frame. You can also add choices of both sound or text notification. It automatically synchronize time from your PC. I have already scheduled my break time with Clever Alarm 3, of course I can’t miss my break fun. Enter a private message to remind you on text notification. Alarm can even be stopped at middle of way. Supports multiple languages (English and Russian). Simple and easy tool to use. Supports multiple audio formats for sound notification including (MP3, WAV, MID). You can also download Music Player in Windows 8 reviewed by us. Head over to the Homepage to download Clever Alarm 3 to your PC . Un zip the file format. Launch the file on your PC. Clever Alarm 3 is a remarkable tool to schedule break timings. As I did, you should also try it out. Hehe,make a calculator and call it Windows 8 calculator… that wouldn’t make any difference. There is lots of similar apps with more functions.